Apples, Peaches and Pears – Oh My! We’ve got a delicious medley of products from Valley View Orchard that we’re offering up in a special promotion for new customers that sign-up between now and our next delivery on Friday, April 7th. 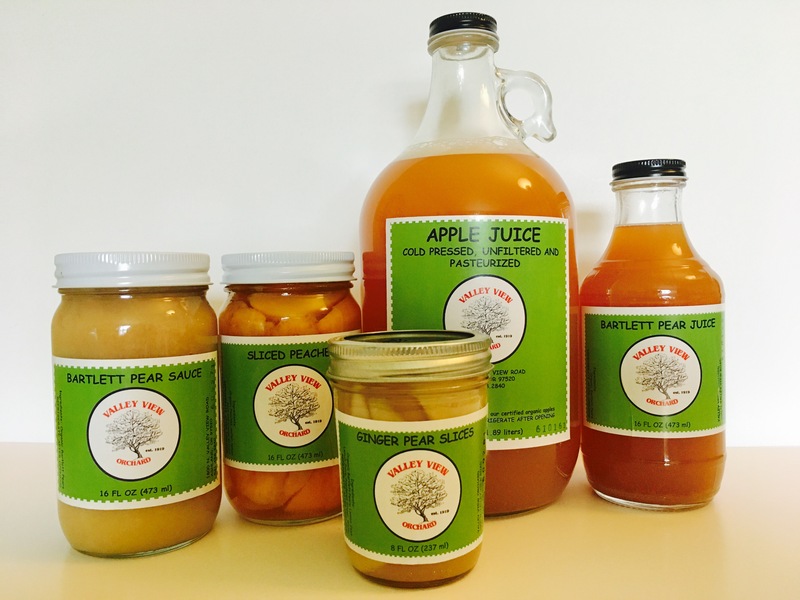 These are 5 of the best sellers from this organic orchard in Ashland: Cold pressed, unfiltered and pasteurized apple juice, ginger pear slices, Bartlett pear juice, sliced peaches and Bartlett pear sauce! All together, these products represent over a $30 value, and we’ll include them in your first delivery when you sign-up for either 6 Standard CSA Shares ($278), or make a minimum deposit of $345 into an Individual Spending Account. We now make home deliveries from Ashland to Grants Pass, Jacksonville to Shady Cove, and everywhere in between! Feel free to give us a call at 541-301-3426 if you have any questions about our service. Our aim is simple – to provide the most convenient and enjoyable way to receive the highest quality produce from our local farms and small businesses. Support local by signing up with Rogue Produce today!